Rewards Canada: IHG Rewards Club Buy Points Flash Sale - 100% bonus for the next 3 days! It has been sometime since IHG Rewards Club has run a 100% bonus for buying their points! Well only about 4 months but still how dare they not have it any sooner! Anyways for the next three days you can score IHG Rewards Club points for only half a US cent each when you buy 26,000 or more points. The maximum number points you can buy depends on if you have bought any yet this year. If you haven't then you can buy 100,000 points and get 100,000 bonus points on top of that. This 100% bonus from IHG is always a good way to score some stays for really cheap, especially if you are redeeming for a PointBreaks hotel! Remember Canadians have to pay GST/HST on top of this amount since points.com is a Canadian company. Here is an example of how this offer can save you some cash. The Holiday Inn & Suites Ottawa Kanata is part of the current PointBreaks so you only need 15,000 points to redeem for room in July. 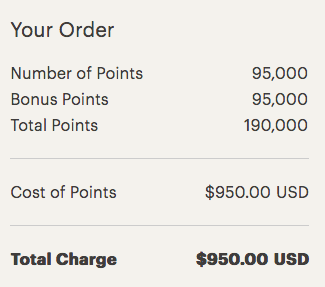 In this case you can actually redeem for a suite that costs $177.18 (non-refundable rate) or $194 (refundable rate) 15,000 points via the buy points deal costs about C$97.50+tax (about $102 to $110 total depending on which province you live in). That means you can save at least $65 for this stay.